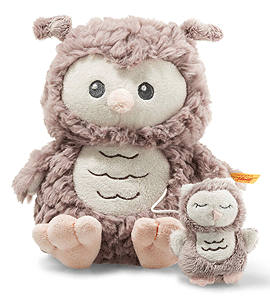 Soft Cuddly Friends Ollie owl music box is made of rose-brown, baby-soft plush fabric, has cream-coloured tail feathers, a pink beak and soft, pink feet. Her face, underside of the wings and tummy are cream-coloured. Her tummy is decorated with golden embroidery. The music box is built into the owl's tummy. It cannot be removed. When you pull the cord with the little sleeping owl, the melody “La Le Lu” begins to play. Bean bags are sewn into her bottom for ideal stability. A wonderful gift idea for a newborn child.